Lowell City Hall is located at 375 Merrimack Street, Lowell, MA 01852; phone: 978-970-4000. Photo: Worcester House, ca. 1802, 658 Andover Street, Lowell, MA. Listed on the National Register of Historic Places in 1983. Photographed by User:Daderot (own work), 2011 [cc0-by-1.0 (creativecommons.org/publicdomain/zero/1.0/deed.en], via Wikimedia Commons, accessed July, 2015. In 1653 the Reverend John Eliot, the apostle of the Indians, established, where the City of Lowell now stands, a town of converted Indians, which was called Wamesit. It ceased to exist in 1686, if not earlier. Lowell, which contains territory once included in the towns of Chelmsford, Dracut, and Tewksbury, was incorporated as a town in 1826. It owes its existence to the abundant water power of the Merrimack and Concord Rivers, at whose confluence it is situated. Pawtucket Falls on the Merrimack, Wamesit Falls on the Concord, and the myriad fish which sported and spawned in these waters, made this place a favorite rendezvous of the Indians long before the Lowell family left their ancient home in Wales. In the 18th century, great quantities of lumber from the forests of New Hampshire were sent down the Merrimack every year in rafts. To facilitate the transmission of these rafts and the passage of boats by the Pawtucket Falls, it became necessary to cut a canal around the Falls. This was done in 1796 by a company incorporated in 1792 under the name "The Proprietors of the Locks and Canals on Merrimack River." The chief object of this company and their canal was to make the Merrimack navigable, for boats and rafts, to its mouth at Newburyport, which object was defeated or superseded by another company, which in 1804 opened another canal (the Middlesex) from above the Pawtucket canal to Boston. 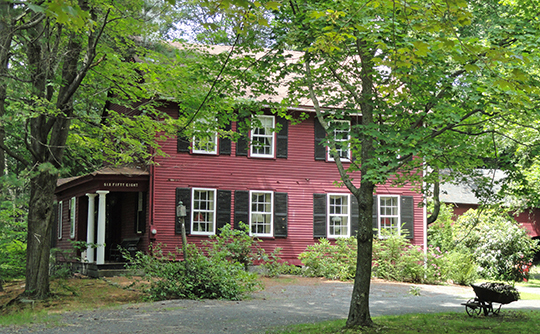 The first woolen carding mill here was started by Moses Hale in 1819. Fisher Ames established a forging mill about the same time. Saw mills and grist mills were also started but all these establishments were small, and the building of Lowell had not yet begun. The first person to suggest the water power of the Merrimack for manufacturing purposes was Ezra Worthen. He made the suggestion to Paul Moody in the autumn of 1821, and together they made a visit to the Pawtucket Falls and canal. Mr. Moody reported the result of his visit to Patrick T. Jackson in Boston, and explained to him, by chalking on his office floor, a rude map of the falls and canal, that a lateral canal could be cut from the Pawtucket canal to the river bank, and how cotton mills built on the bank could be driven by water power of the river running through the canal to their water wheels. A visit was then made to this place by Jackson and Moody, and Lowell is the result. The business of buying up the farms was done as quietly as possible, the conveyances being taken in the name of the agent of the founders. The first farm purchased was that of Nathan Tyler, whose deed bears the date of November 2, 1821. On the 21st of the same month, three other farms were purchased, conveying, in all, about 400 acres of land. Six of the founders then made a visit, walked over the grounds and scanned the capabilities of the place, which was then an inconsiderable village with a tiny population. Trades and Labor Council of Lowell, Mass., Lowell, A City of Spindles, Lawler & Company, Printers, Lowell, MA, 1900.